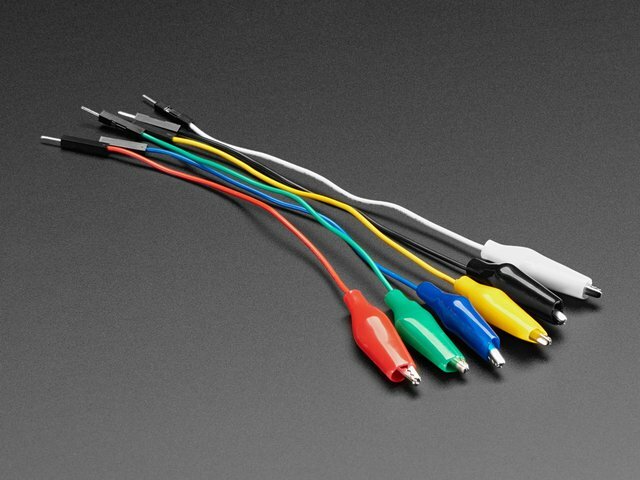 The DAC is just fast enough to generate low-resolution composite video that can be viewed on a television or monitor with composite video input (typically a yellow RCA connector). There are very few pixels, and it’s only grayscale, but it’s sufficient for creating simple games or to print readings from sensors. This also requires the Adafruit_GFX library, which is much easier to install using the Arduino Library Manager: Sketch→Include Library→Manage Libraries… (enter “GFX” in the search field). After the Adafruit_CompositeVideo library is installed, there are a couple of example sketches. One prints the current value from the Circuit Playground light sensor, another shows large horizontal-scrolling text. Connect a couple of test leads to pin A0 and any ground pin. At the other end, connect A0 to the “tip” (center) of the composite video connector, and ground to the “ring” (outside). 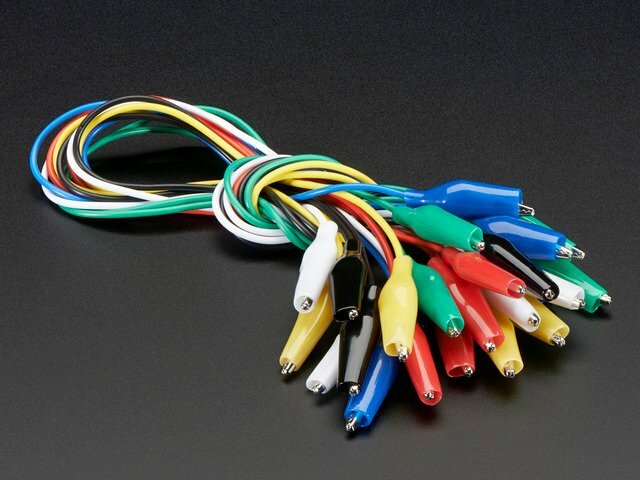 Depending on the TV/monitor connection and available cabling, you may need a spare composite cable or male-to-male adapter to get something you can clip onto. Since I’ll be testing the code often, I cobbled together a somewhat more permanent connector from a spare cable and test leads, but it’s not necessary to go to such lengths if just trying it out. NTSC video runs at 29.97 frames per second. Each frame is comprised of 525 horizontal scanlines. Each scanline starts and ends with carefully-timed synchronization signals, with image data in-between: an analog voltage from about 0.3 to 1.0V determines the brightness at that point along the scanline. Twice per frame, there are also vertical synchronization signals following a specific timing and pattern. Some of these “blips” are just a couple of microseconds long! Digital outputs can easily manage such timing, but for the SAMD DAC this is challenging…the makeshift video signal is just good enough for most screens to latch on to. 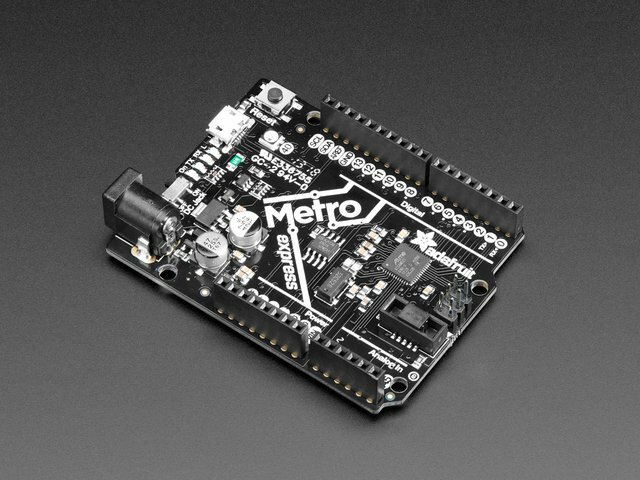 Because it builds upon the Adafruit_GFX library, all the same drawing functions (including fonts) are available as with our other Arduino-compatible displays. “Colors” passed to the drawing functions should be 8-bit grayscale values (0 to 255, where 0=black, 255=white). Adafruit_CompositeVideo and Adafruit_AMRadio (on the next page) both use the DAC peripheral and the same timer/counter; the two libraries can not be used at the same time. The video resolution is extremely crude…it’s more a novelty than anything else. 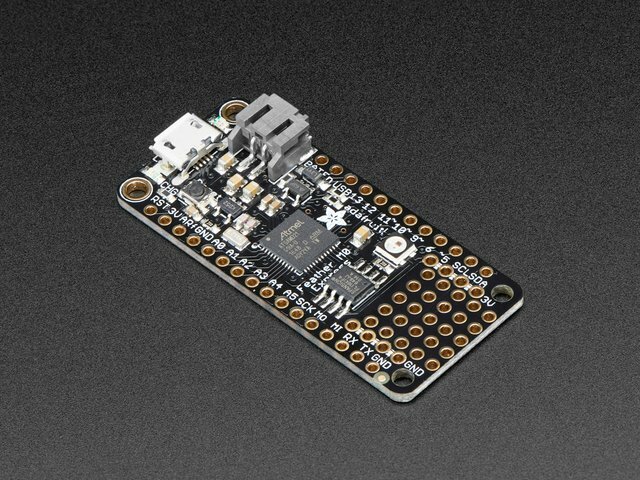 If you need high-quality visuals from a small board, consider a Raspberry Pi Zero! Folks have generated much sharper video (with color, even!) from much more modest hardware. These all require extra components though. 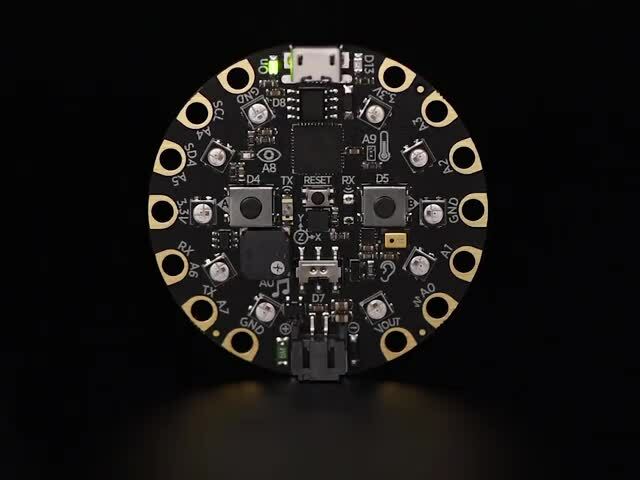 The benefit to this simple gator-clip approach is that classrooms might not allow soldering, or a lesson might not have time for assembling parts on a breadboard. Or it’s just fun showing off. So there’s NTSC, but what about PAL video? It’s not in there. And unless you’re actually using a really old CRT telly, it’s probably not necessary. Most, if not all, LCD monitors that handle composite video will automatically detect and adapt to the video signal, so NTSC is fine. This is true even if you are in a "PAL zone" like Europe! Composite color video is insane and would require a DAC orders of magnitude faster. Let’s see where microcontrollers are in a few years! Another task we can use this fast DAC for is generating AM radio waveforms, which can be heard on a regular AM receiver tuned to the right frequency and held very close by (power is limited and an ideal antenna is impractically long, but it’s a fun proof of concept). After the Adafruit_AMRadio library is installed, there are a couple of example sketches. One plays the Jeopardy theme song over the AM 540 KHz frequency, the other plays a Godzilla roar sound. Clip a test lead or connect a length of wire to pin A0 as a makeshift antenna. Just one end…the other is left unconnected. This is far from an optimal antenna, but we need something there. An ideal antenna would be something like 450 feet long…clearly that’s not gonna happen. The test lead will do fine. Try to keep this as low as possible, but still within the AM band (530 to 1700 KHz). It won’t run at precisely this frequency…the DMA clock has to run at some integer divisor of the 48 MHz CPU clock…so it will pick the closest thing it can muster, which may be a few megahertz to either side. If your AM radio has analog tuning you can dial it in for the best reception, like the old days. This alone does not generate a sound. You then need to call write() repeatedly and quickly to generate an audio waveform. This can be seen in the “zilla” example sketch, which reads from a digitized audio sample stored in program memory and calls the write() function roughly 11,025 times a second. Any existing code that uses analogWrite(A0) to generate sound through the Circuit Playground speaker can be easily modified to use the radio library instead. Amplitude modulation (AM) — the earliest method of sound transmission over radio — conveys a relatively low-frequency variable audio wave (such as voice or music, up to a few kilohertz) into a much higher fixed-frequency radio wave (500 KHz or more), called the carrier wave, by…you guessed it…modulating the amplitude of the carrier wave in direct proportion to the sound wave’s shape. The DAC is barely fast enough to generate a reasonable carrier wave for the lower end of the AM radio band. Our library simply adjusts the peaks and troughs of this wave in response to the Arduino sketch code. Actually the DAC isn’t fast enough for this. We’re cheating! Generating a 540 KHz square wave requires 1,080 kilosamples per second from the DAC, but it’s really only rated for 350 Ksps. We simply feed it at the faster rate. This is not harmful in any way to the DAC, the output just isn’t numerically precise until it’s fully “settled” (the 350K rate), and we’re interrupting it before it gets all the way there. It’s reasonably close though. The video library does something similar, but not quite as fast, as that one does require a little more precision. This is also why it only works toward the lower end of the AM band. As the frequency increases, the DAC output precision decreases. Zooming way in with an oscilloscope, the 540 KHz carrier wave is visible. Though we’re feeding the DAC a square wave, the slow “settling time” produces this truncated triangle wave. This works to our benefit, as the carrier should ideally be a sine wave, and this is a coarse but acceptable facsimile. Zooming out a bit, you can see the carrier wave amplitude (height) being modulated by the lower-frequency sound wave. Zooming out still further, the individual audio samples from a digitized Godzilla roar — 11,050 per second — can be seen. The high-frequency carrier wave is so much smaller by comparison, it appears solid on the scope. Range is extremely limited, just a few inches — this is “science project” fun and not a serious radio transmitter! 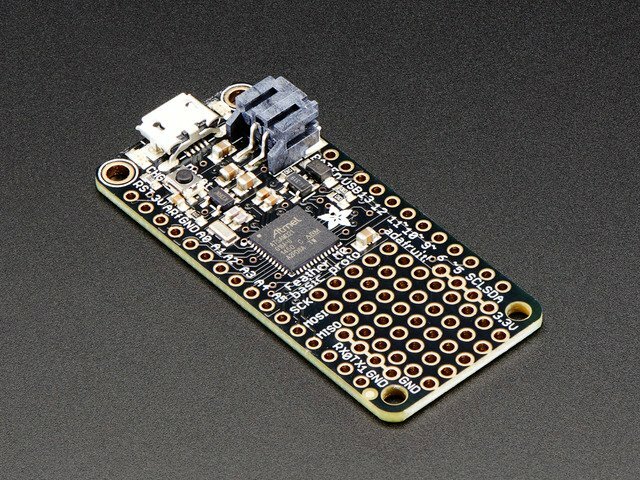 Adafruit_CompositeVideo (on the prior page) and Adafruit_AMRadio both use the DAC peripheral and the same timer/counter; the two libraries can not be used at the same time. Isn’t broadcasting without a license illegal? Even with an amateur license, isn’t broadcasting in this frequency band illegal? Will the FCC haul me away? But hey, if the experiment piques your interest, why not study for an amateur radio license? This guide was first published on Jun 06, 2017. It was last updated on Jun 06, 2017.